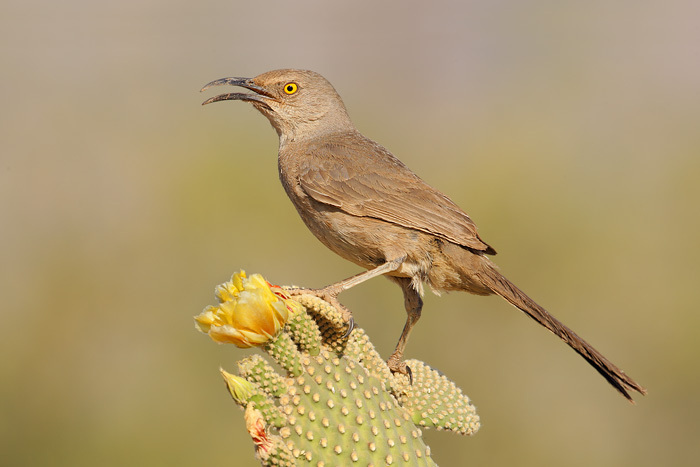 The bird is a Curve-billed Thrasher (Toxostoma curvirostre). 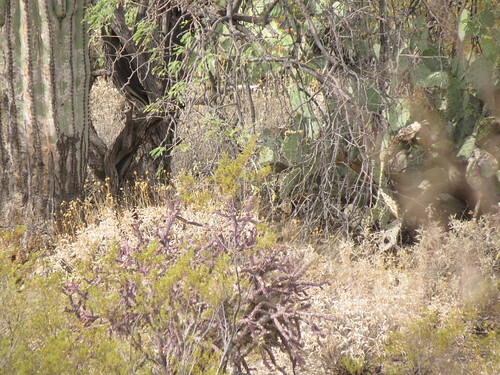 Attached our shot of a couple of the Thrashers peeking out of their saguaro home, and a cropped pic of the same shot. This entry was written by whyevolutionistrue and posted on June 4, 2018 at 12:30 pm and filed under spot the nightjar (and other beasts), spot the ________. Bookmark the permalink. Follow any comments here with the RSS feed for this post. Both comments and trackbacks are currently closed. 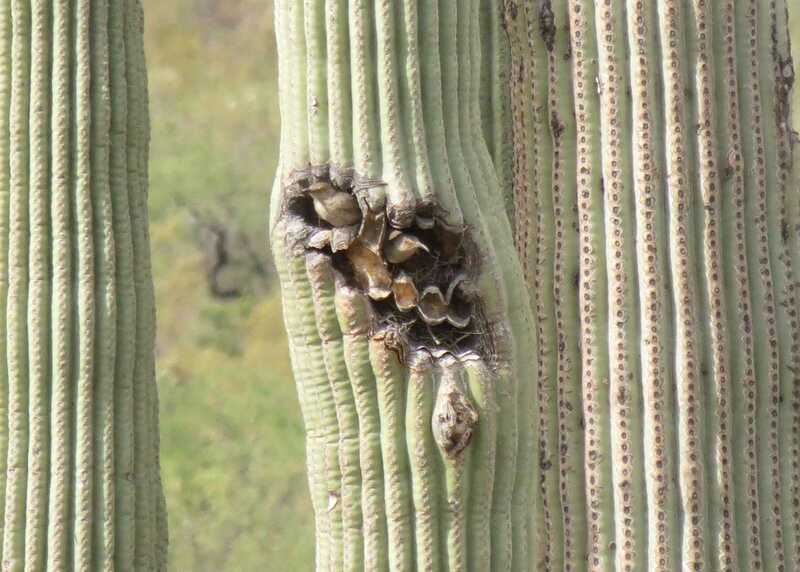 That is so neat that birds can live in cacti. I had no idea. Maybe it’s just my eyes, but I am still having trouble seeing it. I see some form of a frog in a triangle shape. I’ll see it eventually I’m sure. I agree! 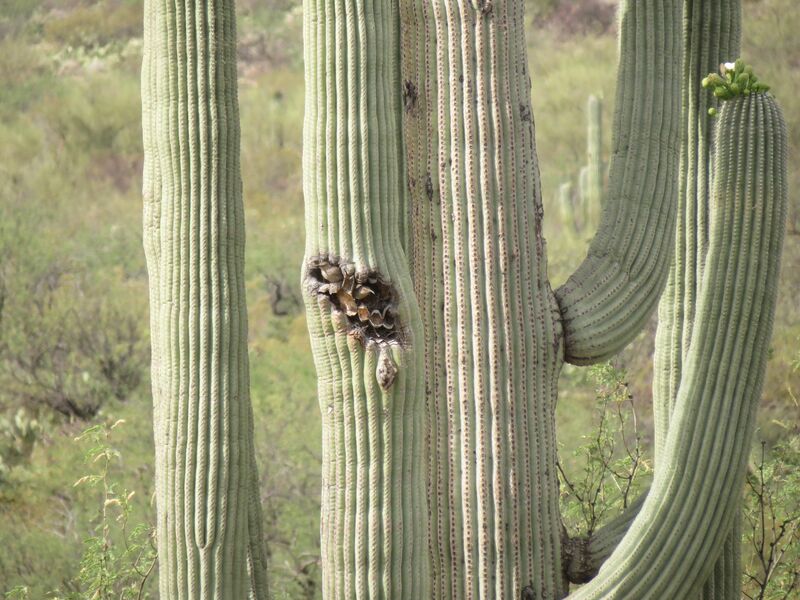 We saw one Saguaro with 3 different species living in it–Purple Martins (! ), the Thrashers, and Gila Woodpeckers. Amazing. The cacti also serve other species in other ways. I’m not sure you WILL see it. Again, this resolution makes it tough. I did, however, just post the file to Flickr, and IMO it’s better. Yes! I saw it right away! The eye is in the lower left of the red box and the tail is in the upper right. Thank you! I just joined Flickr so if it’s okay, I’ll follow you. Okay. I have no idea what I’m doing but I clicked “follow”. Hopefully I make some more connections soon. It’s much better than Instagram for posting photographs with a decent camera. Thanks again for sharing where the bird is located more clearly. Much appreciated! Liz, thanks for wanting to follow me. 🙂 Though be aware that a lot of the pics I put up are for ID purposes* or similar reasons; I’m not one of those who post only lovely, post-processed photos (though I sometimes do so when I have them!). *For instance, the pics just after the water snake & the owl are screen shots I took from international web-cams when I was making a web-cam life-list for fun. 🙂 Certainly not a photographer’s dream! I’m also bad about identifying whatever the subject is online–this not only annoys other people, it screws me up as well when I want to search my photostream! Laziness, thy name is Diane. Thanks for the heads up. I’m new to taking pictures of birds although I’ve been watching the turkey vultures for about three to four years. My disclaimer is that I’ve been taking pictures of birds without knowing anything about them. I’ll identify them after when I can look them up. Gulls and crows are beautiful to me and I’m just learning as I go along! That helps slightly – thank you very much – I had it the wrong way around even after knowing where it was. What’s the deal with resolution? Does it have to be insane-resolution to be at all fair? And what can we do? That beetle was also unfair, I think. but these “spot the _” posts are still very fun! Also – my vision is of late iffy. But let’s not get into that. Thyroid, please see all the discussion in this thread and the original find-the post by those of us trying to figure out why the posted photos were coming out so poorly. Conclusion–it’s a (new-ish) WordPress phenomenon. Meanwhile, links to clearer pics of the original have been posted. Hey this triggered my trypophobia a little haha. I don’t see it. But, I do sometimes see Curve-Billed Thrasher’s in my yard. That’s even better! It was a lifer foe me when I got it in the Lower Rio Grande Valley a few years ago. With all due respect, there needs to be a rule on these “spot the pigeon” images. We actually have to be able to make out the creature in question in the reveal image. I really can’t make out the bird even after seeing what kind of bird I’m looking for. Am I all alone here? I found it within seconds of opening the image in Jerry’s original post in a new tab. Admittedly it isn’t very good resolution, but I picked the bird out in seconds. 1) I’m sure what any given image is viewed on makes a difference. I viewed this one on a 22″ – 24″ HD monitor. 2) I’ve noticed over a period of time that in a large percentage of these “spot the ___” images that the critter is in the central part of the image, just as you would expect if the photographer was aware of it and was intentionally targeting it. So I tend to look there first. 3) Sometimes your eye can catch patterns better when zoomed out rather than zoomed in. I first spotted this bird at just 150%, the size it was at when I first opened it in a tab (i.e., that was the zoom setting of the last image I opened and my browser remembers that and keeps that setting unless changed) then enlarged to 300% to verify it. It just looks like a blurry mess inside the red rectangle. Thanks, Paul! Yeah, looks exactly like what first appeared on WEIT. I’d like to apologize to all recent find-the submitters for intimating in other recent find-the posts that there may have been some intentional resolution-degrading going on! By the way, if you return to the original post, there’s a cleared picture up there now. Yes, that’s much better! Thanks! I can see the thrasher now. Darrelle, this is very helpful! I’ve just posted a long-winded bit about my conclusions at the original “find the” post, but this info is more helpful, I think. 1) For some time now all I’ve been using is my MS Surface–so, a rather small image to begin with–but the bird was obvious to me, too, when I first searched the original, trying to figure out why I took that shot. No, you’re not. Personally, I spotted three or four birds in the picture, but they were pareidolia. Yes, I’m now seeing birds everywhere. No, you’re not. I’ve been making the same complaint for a while, now, and so have many others. Now I feel guilty for insinuating in some of the previous find-the-s that there was some nefarious scheming going on! Not a lot of people are going to read our sleuthing here, so I suppose we could suggest to anyone who sends in a pic and ends up with a similar problem that they please try hosting the pic off-site and providing a link to it. Nice flowers on the cactus, too.